On this 28th day of the Celts to the Creche, we meet St. Deiniol of Wales (St. Daniel). It seems appropriate that he would be on this journey with us to the manger stall where Christ was born as he visited Bethlehem while he was Bishop and Abbot of Bangor in the kingdom of Gwynedd, Wales. His father was the founder of the famous Bangor-is-y-coed Monastery (Bangor below the woods) on the River Dee where people from all over England would come to study. In early Celtic Christian times, it was not unheard of for priests to be married. St. Deiniol founded a monastery on the Menai Strait that he named Bangor, after the wattle fence that surrounded it. His church became a cathedral and it grew into a large diocese. This monastery was founded under the patronage of Maelgwn Gwynedd who endowed it with lands and privileges, later raising it to the rank of the official seat of a bishop, sharing a common boundary with the principality of Gwynedd. Deiniol spent the remainder of his days here as Abbot and Bishop. You may desire to continue reading more about Deiniol or go on to the Meditation towards the end of this page. Life of St. Deiniol: We know about St. Deiniol from a Latin Life of Deiniol, preserved in Peniarth MS226 and transcribed in 1602 by Sir Thomas Williams of Trefriw. There was also a poem written in 1527 by Sir David Trevor, parson of Llanallgo, which gives a few extra details of the saint’s life. 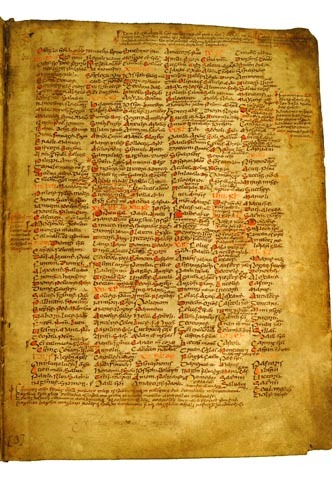 The first mention of Deiniol comes from the 9th century Irish Martyrology of Tallaght where he is one of only three Welsh saints to be included showing the importance of his foundations in the pre-Viking period. He was the son of Abbot Dunod Fawr (Dunawd), son of King Pabo Post Prydain, who lost a battle with the king of the Picts. With the defeat, the family lost their land in Southwest Scotland but were welcomed and given land by the king of Powys, Cyngen ap Cadell. This friendship was sealed when King Pabo’s daughter married a son of King Cyngen. Deiniol’s father, Abbot Dunod Fawr was the founder of the famous Bangor-is-y-coed Monastery (Bangor below the woods) on the River Dee about four miles southeast of Wrexham. It was known to the English as Bancornaburg. This large monastery was likely located between the present village and the racetrack. Bede in his Ecclesiastical History of the English People spoke of this monastery saying that it was so large that it was divided into seven groups each with their own superior. Bede also records an interesting showdown about 604 at Bangor-is-y-coed between St. Augustine of Canterbury and seven British bishops. St. Deiniol’s Calling as Bishop of Bangor: Deiniol is said to have studied at his father’s monastery and also under the famous teacher Cadoc of Llancarfan. He spent his early life as a hermit in Pembrokeshire, yet was called to be a bishop despite deficiencies in his formal education. When the bishoporic of Bangor became open, after praying, the people were led by the Spirit to Deiniol who was living in the wilderness. In course of time, the Cathedral Church of Bangor becoming vacant through the death of its Bishop, those to whom the election or provision of a Bishop in that Church pertained met; the grace of the Holy Spirit was invoked, and it was revealed from heaven that they should send without delay into Pembroke, and choose a certain eremite dwelling on a mountain in the southern part of Pembroke, to be Bishop and pastor of their Church, and it was added that he was named Daniel. They at once sent messengers to the aforesaid part. The messengers, coming there, found the eremite in the place we named before, and, having first greeted, him, ask him, “What is thy name?” He humbly replied, “I am called Daniel, but am no prophet.” Then the messengers rejoiced with great joy, and told him in detail the object of their journey and arrival there. But he, being incredibly astonished, says, ” How can this be, that you claim me as Bishop-elect, since I have hardly the elements of learning nor any knowledge of letters?” In reply they said, ” It is the will of God that it should be so.” And he, being overcome by their insistence, and wishing to obey the Divine call, left all that he had, and followed them in the name of the Saviour, until they arrived at the entrance of the city of Bangor. And at once all the bells of the city were rung without the hand of man. But when the people who were in the city heard the sound of the bells they went into the Church, and, finding no one ringing the bells, said to one another that it was a miracle which the Lord had wrought; and immediately, lo, the messengers with Daniel now stood at the Church doors. Then the clergy of that Church, conducting Daniel to the High Altar of the Church, and singing with the utmost fervour the “Te Deum Laudamus,” praised the Saviour’s mercy. And when S. Daniel arose from prayer he was so endowed with all ecclesiastical knowledge that no one in Britain seemed then like him in knowledge and letters. St. Deiniol attended the Synod of Llanddewi Brefi in Ceredigion, Wales c. 545 or 560 with St. David of Wales when the subject of rules for penance was being discussed. It is also thought to be the synod in which Pelagius (see day 18 of Celts to the Creche) was declared a heretic postmortem. It was said that the young abbot David spoke so eloquently at this synod that Bishop Dubricius immediately retired and made David the Bishop. Then the first thing David did as a newly consecrated Bishop was to consecrate Deiniol as Bishop of Bangor. St. Deiniol had a son named St. Deiniol the Younger who succeeded him as Abbot of Bangor. The village of Llanddaniel Fab in Anglesley, eight miles southwest of Bangor is named after St. Deiniol’s son. Day of Resurrection and Influence: According to the Annales Cambriae (Annals of Wales), Deiniol died in 584 and was buried on Bardsey Island. 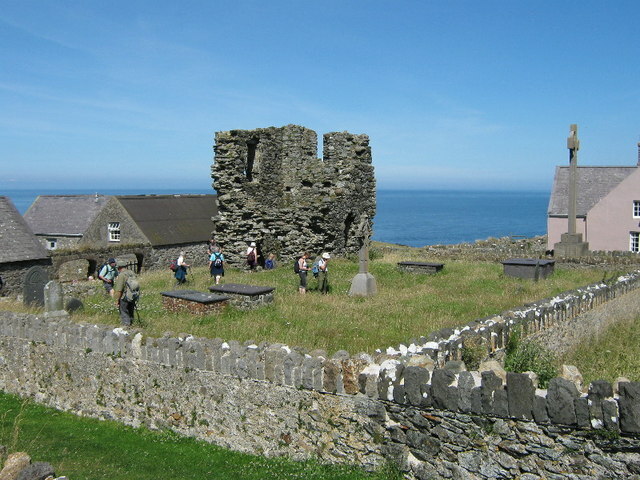 St. Deiniol’s Bangor Monastery was destroyed by the Vikings in 1073. All that remains are some geometric carvings on a few stone slabs that can be viewed in the cathedral. 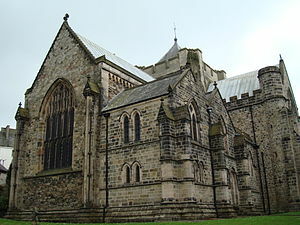 But the 14th c. Bangor Cathedral was built upon the church there and became one of Britain’s earliest dioceses. 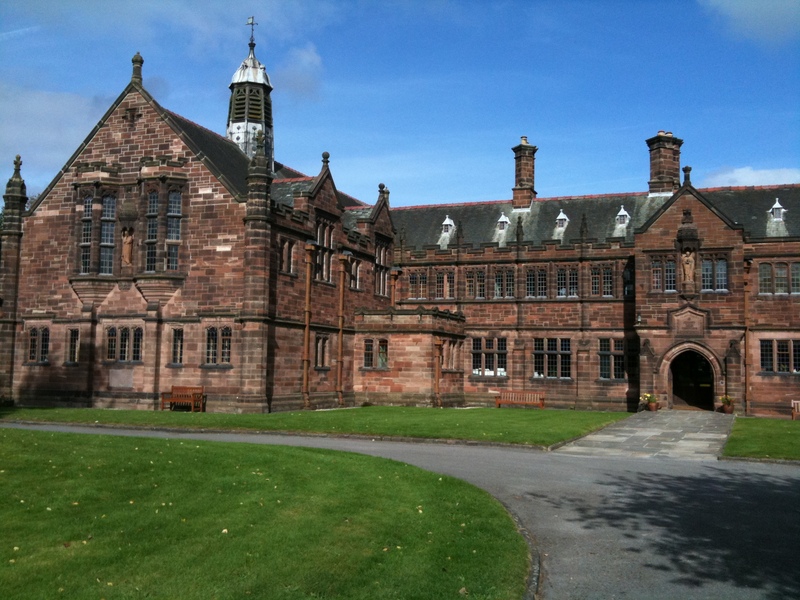 Prime Minister William E. Gladstone dedicated his library in Hawarden, Flintshire, Wales to St. Deiniol. Until recently, the magnificent residential library that was established by Gladstone for “divine learning” was called St. Deiniol’s Library. 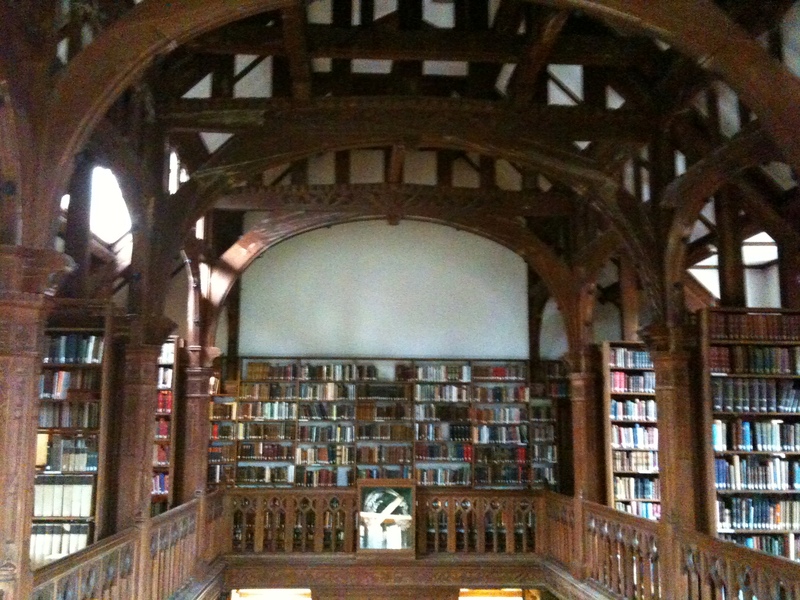 Today it is called Gladstone’s Library. On a personal note, I was blessed to receive the Canon Symonds Scholarship to live at Gladstone’s Library and study in her incredible library while on sabbatical from my church in September 2009. For a pastor and former theological library director who loves church history to live in this library, to eat daily gourmet meals, and to be able to use this library at any time day or night was beyond my wildest dreams or imaginations. I am so very grateful to the Warden, Rev. Dr. Peter Francis for allowing me this amazing privilege. It was during this stay that I studied the Celtic and Anglo-Saxon saints that significantly aided in the preparation of this series of Celts to the Creche: A Celtic 40 Days of Advent Devotional. 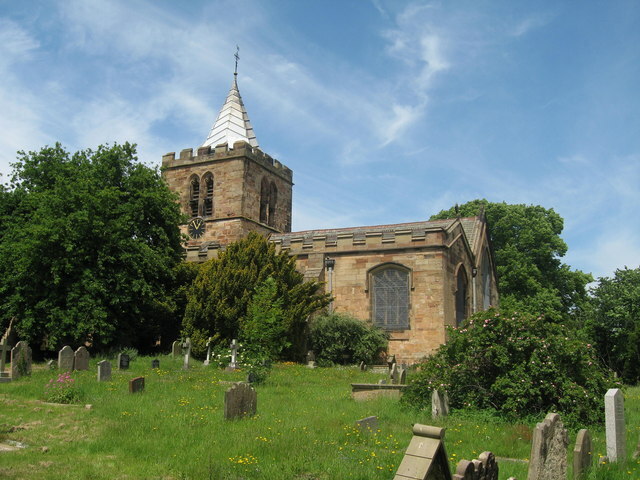 The Hawarden church next door to the library is dedicated to St. Deiniol. I worshipped there when I was in residence at Gladstone’s Library. Prime Minister Gladstone and his wife Catherine are buried inside the church. Besides Bangor Cathedral there are other churches in Wales and in Brittany, France dedicated to St. Deiniol. There are numerous miracle stories connected to St. Deiniol including one in which he did not have any oxen to plow his fields. A pair of sturdy stags came out of the forest and he put the yoke on them and they plowed his field and then returned to the woods. The Spirit often works in ways we cannot dream or imagine. The hermit Deiniol never dreamed of being a Bishop of a Cathedral, but like Mary he followed the call upon his life. 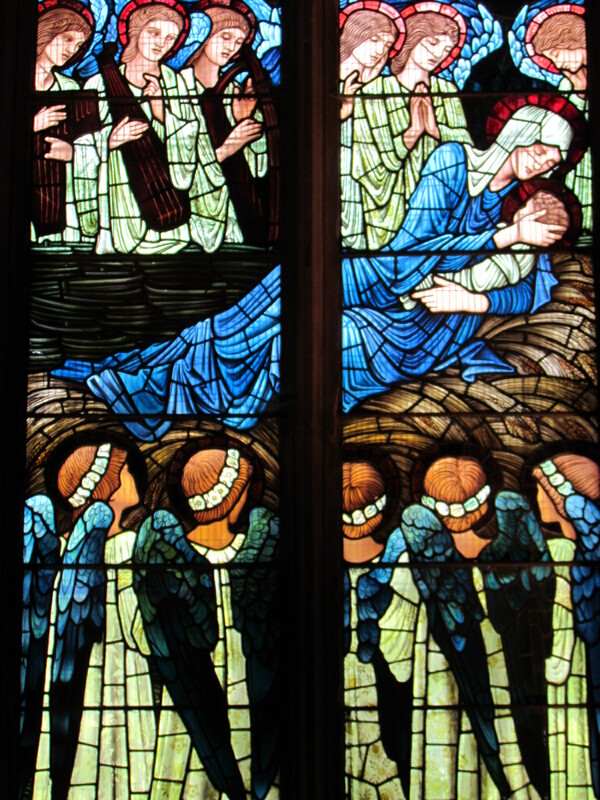 Deiniol even uttered the same words as Mary, “how can this be?” When God calls us to a place of service in life, may we like Mary and Deiniol answer in the affirmative…it might just be life and history changing. Annales Cambriae (Annals of Wales). at Medieval Sourcebook. Baring-Gould, S.and John Fisher. The Lives of the British Saints: The Saints of Wales and Cornwall and Such Irish Saints as Have Dedications in Britain. from Archive.org. Blair, Peter Hunter. The World of Bede. Cambridge: Cambridge University Press, 1970, 1993 reprint. Jones, Andrew. Every Pilgrim’s Guide to Celtic Britain and Ireland. Live in a Library Blog. Gladstone’s Library. Youtube. April 6, 2017. Martyrology of Tallaght. available online at googlebooks. Parish of Oystermouth, Swansea. St. Deiniol. Peters, Jane. St. Deiniol at Stories of the Saints website. Rees, Elizabeth. Celtic Saints in Their Landscape. Sutton Publishing, 2000. ___________. Celtic Saints: Passionate Wanderers. New York: Thames and Hudson, 2000. ___________. An Essential Guide to Celtic Sites and Their Saints. London: Burns & Oates, 2003. St. Deiniol. September 11. National Calendar of Wales. St. Deiniol’s Church, Hawarden. Historic Wales Guide. This entry was posted in Uncategorized and tagged 40 day Celtic Advent devotional, Advent Devotional, Annales Cambriae, Bangor Cathedral, Bangor Monastery, Bangor-is-y-coed, Bishop of Bangor, Celtic Advent Devotional, Celtic Saints, Celts to the Creche, Flintshire, Gladstone's Library, Hawarden, Llanddaniel Fab, Online Advent Devotional, Rev. Peter Francis, Saintsbridge, St. Daniel, St. Deiniol of Wales, St. Deiniol's Library, Welsh Saints. Bookmark the permalink.